Our EL Wire is the Brightest in the world. 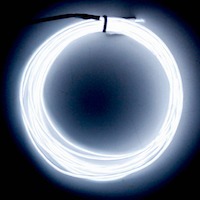 ... EL Wire Online - Our new High Bright EL Wires are brighter than any other in the world! New Polar Bright 3 Wire. This product is a MUST have when quality and brightness are required. EL Wire is a thin electroluminescent wire that looks like neon when hooked to a power pack, These strips are EXTREMELY bright. Our new Polar Bright 3 High Bright EL Wire is perfect for every use and events and costumes the possibilities are endless with EL Wire, priced right and made to last. Polar Bright 3 EL Wire will make your projects come to life. Use with any inverter or sequencer for amazing lighting effects. (2) The NEW 3rd Generation 5.0mm El Wire can be bent and it will hold more of it shape which means less mounting points. When Ordering This NEW 5.0mm High Bright El Wire With Our Current Inverters YOU NEED TO MAKE SURE you ONLY Order Half The Length Of What The Inverter Can Power.